Potential Mars One astronauts will train for the one-way mission to Mars in simulated colonies here on Earth. The Netherlands-based Mars One project announced today the launch of a simulation project as part of training for its Mars colonization mission. Mars One will soon begin construction of a simulated outpost on Earth, meant to replicate the future Mars outpost. The early version of the outpost will be used to give potential crew members experience with the technology and the isolated and cramped living conditions on Mars. Mars One co-founder Bas Landsdorp says, "We are very eager to get started constructing actual hardware for our mission that is important for training future Mars One crews and preparing them for their life on Mars. We are going from theory to practice." Newly added Mars One team member Kristian von Bengston will be leading the outpost project. Mars One is currently searching for construction companies and sponsors for the project. "Finally getting started on the outpost project is incredibly exciting and I am looking forward to replacing images with real life hardware," says von Bengston. "I think a lot of people are looking forward to opening the hatches of the outpost modules and taking the next step in the mission. I know I am." Mars One plans to build multiple outposts in different locations, for easier training of its 1058 potential colonists. The simulated outposts will not have actual life support systems at first, but will add those systems later. 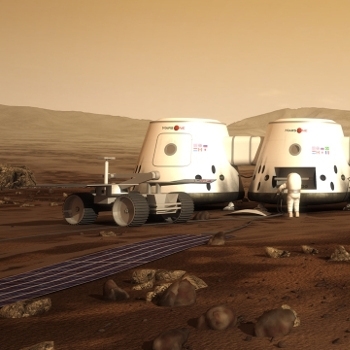 Mars One has not yet decided on the location for the first simulated outpost. Mars One received over 200,000 resumes from its public call for people willing to take the one-way trip to Mars. Those applications were narrowed down to 472 women and 586 men from around the globe. Over the next two years, Mars One will further narrow the pool of candidates to between 24 to 40 people. Mars One has already secured funding for its unmanned mission to Mars in 2018. The first private mission to Mars will demonstrate the technology necessary for future manned missions. Lockheed Martin and Surrey Satellite Technology Limited have signed on for the mission. The ultimate goal of Mars One is to send astronauts to Mars in groups of four, beginning in 2025 and launching subsequent crews every two years.